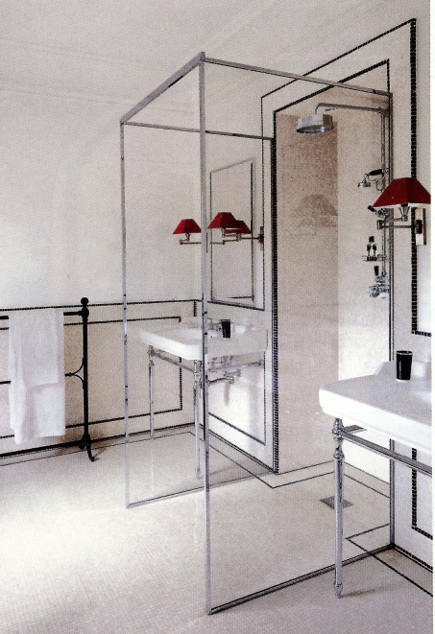 Glass partition shower is a modern solution for an old house bath. Baths without barriers – or wet rooms – can take on unique configurations because there are few if any partitions. In a renovated Italian farmhouse by architect Benedikt Bolza, this guest bath, with a glass enclosed shower, illustrates the idea in a unique way. White mosaic tile on the walls and floor create the waterproof surfaces needed for the shower. Black mosaic dots have been added to define wainscot panels on the walls and to create the illusion of architecture for the shower by outlining the frame and floor line. However, the shower itself is little more than a niche in which surface-mounted controls and a rain shower head have been placed, with a drain below. To keep it practical, two sheets of glass suspended in a metal frame create a curtain on each side of the niche to keeps water from splattering everywhere while preserving the open look. Practically speaking, positioning the shower between a pair of Lefroy Brooks console sinks keeps all the essential plumbing on one wall. And white this wet room appears quite spacious, sandwiching a shower between two sinks in this style seems ideal for a tight space. I did 2 wet rooms in our 1890 Victorian. One in our attic conversion space 10 yrs ago and the other in our master bath remodel 7 yrs ago. I didn’t use any glass at all , a complete wet room design. so much less cleaning 🙂 I have the rain shower heads also. The water is much more contained with that style. I feel like I am in an outdoor shower year around with the skylights overhead .